Please don't hesitate to get in touch to arrange an initial appointment. MABEL PLUS is medically endorsed with full clinical trials to support treatment claims and it is both CE and FDA approved. Treatments are perfectly safe as the levels of radio frequency energy used are very low, unlike those emitted from mobile phones and other electronic devices which may adversely affect us. 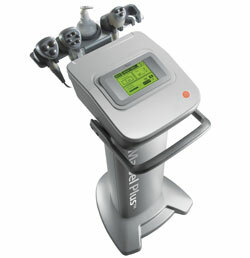 The deep heating technology of the MABEL PLUS RF treatment allows skin to repair itself naturally. That process, in turn, creates natural looking results that get better with time. MABEL PLUS TRI POLAR RADIO FREQUENCY treatments offer immediate results which continue to improve as the production of new collagen, elastin and hyaluronic acid are stimulated and fat and toxins are drained. MABEL PLUS is the optimal non-invasive way to tighten your skin and contour your body. Enjoy immediate visible improvement and long-lasting results with no surgery and no downtime. With this simple and convenient “walk-in, walk out” procedure, you can maintain your daily routine... and come out looking younger and feeling better than ever! MABEL PLUS RF treatments stimulate your body’s natural collagen renewal for incredible skin-tightening results and a substantial improvement in the appearance of wrinkles. MABEL PLUS RF treatments contour your skin and give it a fresh, healthy rejuvenated appearance and texture. MABEL PLUS treatments can give you the look you have always dreamed of – painlessly. For any skin type and colour. As you age, your skin’s collagen and elastin – which are proteins that keep your skin tight – break down faster. As your skin loses elasticity, you may develop wrinkles and fine lines, including crow’s feet, shadows between your nose and the corners of your mouth and your skin may appear more tired and dull. MABEL PLUS RF technology focuses deep heat to the collagen layer causing existing collagen to contract for an immediate improvement and skin tightening effect. Over the long-term, this heating accelerates metabolism to augment generation of new collagen fibers – for a tighter, smoother, more contoured shape, appearance and texture. Long-term results vary depending on the area to be treated and the desired result. In general, you will need to undergo between 4 and 8 treatments on average. The number of treatment sessions is determined according to your specific needs by the physician or aesthetic professional. In order to sustain the results, it is important to maintain a lifestyle that includes a healthy diet and exercise. Treatment feels like a warm massage. It is pleasant and pain-free. Some patients even report falling asleep during treatments. The treatment lasts 30 to 60 minutes, depending on the treatment area. MABEL PLUS passes low level RF energy via the hand piece through the skin surface, targeting the collagen and elastin fibres and fat cells beneath. The skin surface is undamaged and the RF energy leaves all other tissues such as nerves, blood vessels and muscles unaffected. The RF energy causes the collagen and elastin fibres and fat cells to heat up. The collagen and elastin fibres respond by contracting which causes them to tighten, and the fat cells open and drain and reduce in size. The fat cell contents are carried away by the lymphatic system and excreted from the body over time. When the collagen and elastin fibres tighten, lines and wrinkles are smoothed and the skin is firmed and lifted. When the fat cells cells drain and shrink, the silhouette is slimmed and streamlined. The combined skin tightening and fat cell reduction are especially effective on double chins, cellulite, bra bulge, saggy inner thighs, bingo wings etc. Treatments are suitable for all skin colors, including dark and pigmented skin. The treatment is based on Radio Frequency (RF) energy: energy that produces heat in the target area. Unlike lasers or other optical energy-based devices, RF is “colour blind” meaning that it has no affinity to skin pigmentation, such as melanin or haemoglobin. In general, if you are healthy, then you are a suitable candidate for treatments. There are a very few specific treatment contraindications such as: pregnancy, superficial metal implants in the treatment areas, and a pacemaker. Your physician or aesthetic professional will confirm your suitability after taking a brief medical history. After treatments, you can immediately return to your daily routine. It is a “walk-in, walk-out” procedure with no downtime. Treatments are suitable for women who are post-pregnancy for circumference reduction and tightening of loose skin. However, it is recommended to start the treatment only between 1 and 3 months after delivery, in accordance with each individual’s recovery. "A stunning effect on jowly necks and double chins"
The Tri-Polar device rolls over the face, delivering radio frequency into the skin, contracting existing collagen fibres, giving an immediate visual tightening effect that lasts several days. Most compelling, however, is the stimulation of new collagen production, the benefits of which become evident in the weeks ahead. When re-calibrated, the Tri-Polar also has the ability to shrink and disperse fat cells, so when combined with the skin-tautening effects of the treatment, it has a stunning effect on jowly necks and stubborn double chins." "A lift without needles or knives"
The lowdown: "Facialist Caroline Gregson (in London) is full of the joys of her new Tri-Polar Radio Frequency Contouring system. It has just landed from South Korea and works by heating the deep collagen fibres in the skin so that they contract and tighten. Caroline also sees men, who tend to come to her after seeing how well their wives look. The facial involves a five-pronged wand buzzing around the face. Our verdict: If you're tired and strung-out and about to go to a big party, this really kickstarts the skin, drawing up your jawline and easing fine lines."